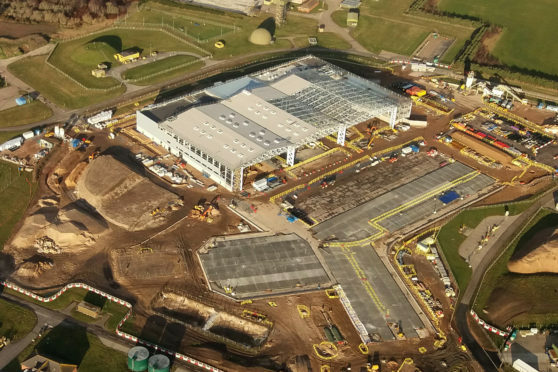 The new Poseidon P8 Facility being built at RAF Lossiemouth. The future home of the RAF Lossiemouth’s new fleet of submarine hunting planes is on target for completion. Once established, the facility will house up to three P-8A Poseidon Maritime Patrol Aircraft, along with maintenance facilities, planning rooms and office space for the operators and support staff. Images released by RAF Lossiemouth show the scale of the development so far, with more than 150,000 hours being put into the project. It forms part of the £400 million expansion project that will bring in an extra 480 personnel to the Moray base. Part of a long-term initiative between the UK Government and Boeing, it will support the P-8A Poseidon in its roles of maritime surveillance, anti-submarine warfare, and anti-surface ship warfare. Many of those working on the facility are local to Moray, and it is expected that around 200 civilian jobs will be created in the local area once the facility is complete. The first of the submarine hunting aircraft is expected to be handed to 120 Squadron towards the end of 2019, before making its first appearance in the UK in early 2020. It will help to protect the UK’s nuclear deterrent, as well as the Queen Elizabeth class aircraft carriers. While the facility is under construction in the UK, crews on 120 Squadron continue with their training on the P-8A Poseidon at Naval Air Station Jacksonville, Florida. Recently operating the aircraft off the east coast of the United States, a UK crew was instrumental in saving two men who had serious injuries. At the time the crew were hosting VIPs for a demonstration flight, but after picking up distress calls they changed course, assisting with the search and rescue operation while on-scene. The crew acted as a crucial communications link between the agencies involved in the rescue, which included the US Coast Guard, and are credited with saving the injured men’s lives.